PepsiCo, Inc. issued the following announcement on Aug. 7. 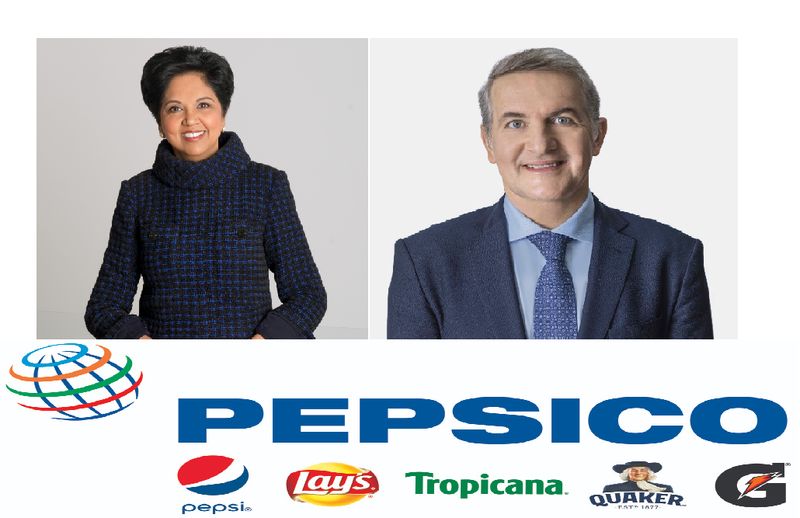 PepsiCo, Inc. (NASDAQ: PEP) ("PepsiCo") today announced that its Board of Directors has unanimously elected Ramon Laguarta, 54, to succeed Indra K. Nooyi, 62, as Chief Executive Officer. Nooyi will step down on October 3rd after 24 years with the company, the last 12 as CEO. She will remain Chairman until early 2019 to ensure a smooth and seamless transition. Laguarta was also elected to the company's Board of Directors, effective October 3rd. "Leading PepsiCo has truly been the honor of my lifetime, and I'm incredibly proud of all we have done over the past 12 years to advance the interests not only of shareholders, but all our stakeholders in the communities we serve," said Nooyi. "Growing up in India, I never imagined I'd have the opportunity to lead such an extraordinary company. Guided by our philosophy of Performance with Purpose—delivering sustained performance while making more nutritious products, limiting our environmental footprint and lifting up all the communities we serve—we've made a more meaningful impact in people's lives than I ever dreamed possible. PepsiCo today is in a strong position for continued growth with its brightest days still ahead." Nooyi continued: "Ramon Laguarta is exactly the right person to build on our success. He is a terrific executive with a long and proven track record of growing businesses. He has a deep understanding of the changing preferences of consumers and other critical trends unfolding around the world, and he has demonstrated that he knows how to navigate them successfully. Ramon has been a critical partner in running the company, and I'm confident he will take PepsiCo to new and greater heights in the years to come." "She has delivered strong and consistent financial performance, managing with an eye toward not only the short-run, but the long-run as well. As CEO, she grew revenue more than 80%, outperforming our peers and adding a new billion-dollar brand almost every other year. And shareholders have benefited: $1,000 invested in PepsiCo in 2006 is worth more than two-and-a-half times that amount today. Commenting on his appointment, Mr. Laguarta said, "I'm incredibly humbled and privileged to be appointed the next CEO of PepsiCo, and I want to thank the Board of Directors for the confidence they have placed in me with their decision," said Laguarta. "I also want to thank Indra for her overwhelming support. She has transformed the company with her bold vision and outstanding leadership, and I feel fortunate to have her as a mentor and a friend. And of course, I want to thank all of my colleagues, as well as the customers, bottlers, partners, and investors who are part of the PepsiCo family. I look forward to working more closely with all of you in the months and years ahead, and to continue growing this special company long into the future." Laguarta has held a number of executive and general management roles in his 22 years at PepsiCo. Since September 2017, Laguarta has served as President of PepsiCo, overseeing global operations, corporate strategy, public policy and government affairs. Previously, Laguarta served as Chief Executive Officer, Europe Sub-Saharan Africa, one of PepsiCo's most complex businesses with operations spanning three continents and comprised of developed, developing and emerging markets. Prior to that, he served as President, PepsiCo Eastern Europe region and served in a variety of sales, marketing and other commercial roles across Europe. "Ramon Laguarta's unanimous appointment follows a systematic and thorough succession process by the Board of Directors. Laguarta equally represents continuity and the necessary agility for PepsiCo," said Daniel Vasella, Chairman of the Board's Nominating and Corporate Governance Committee. "Ramon is a strong and proven executive with an outstanding track record growing organically and by acquisition some of PepsiCo's largest and most important international businesses. He keenly understands the evolving needs of consumers and customers and the trends affecting our business in markets around the world. He will bring the depth of experience and innovative thinking that has powered his previous achievements as he is inheriting a well-positioned company poised to continue delivering top-tier performance. Indra has been a visionary leader who transformed the corporation and led it to unprecedented success. Her leadership skills, strategic acumen, dedication and integrity have been critical to the sustained success of the corporation and the development of top talent." With Nooyi's departure, the rest of PepsiCo's senior leadership team will remain unchanged. Laguarta's direct reports will be: Hugh F. Johnston, Vice Chairman and Chief Financial Officer; Dr. Mehmood Khan, Vice Chairman and Chief Scientific Officer, Global Research and Development; Albert P. Carey, Chief Executive Officer, PepsiCo North America; Vivek Sankaran, President and Chief Operating Officer, Frito-Lay North America; Kirk Tanner, President and Chief Operating Officer, North America Beverages; Laxman Narasimhan, Chief Executive Officer, Latin America and Europe Sub-Saharan Africa; Silviu Popovici, President, Europe Sub-Saharan Africa; Mike Spanos, Chief Executive Officer, Asia, Middle East and North Africa; Dave Yawman, Executive Vice President of Government Affairs, General Counsel and Corporate Secretary; Jon Banner, Executive Vice President, Global Communications and President, PepsiCo Foundation; and Ruth Fattori, Executive Vice President and Chief Human Resources Officer. Continuing to report to Laguarta will be Jim Andrew, Executive Vice President, Chief Strategy and Transformation Officer; Grace Puma, Executive Vice President, Global Operations; and Eugene Willemsen, Executive Vice President, Global Categories & Franchise Management. In closing, Nooyi said: "Today is a day of mixed emotions for me. This company has been my life for nearly a quarter century and part of my heart will always remain here. But I am proud of all we've done to position PepsiCo for success, confident that Ramon and his senior leadership team will continue prudently balancing short-term and long-term priorities, and excited for all the great things that are in store for this company. PepsiCo's best days are still ahead of it." Want to get notified whenever we write about PepsiCo ? Next time we write about PepsiCo, we'll email you a link to the story. You may edit your settings or unsubscribe at any time.